Nine-year-old Conner and seven-year-old Cayden Long have never won a race. In fact, they always finish last. 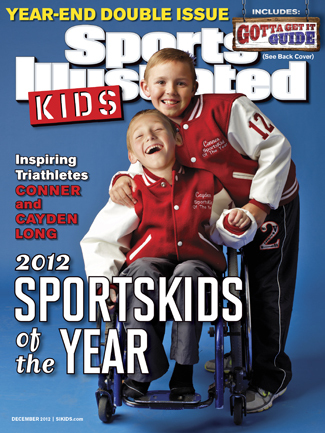 But last month, Sports Illustrated Kids voted them 2012 SportsKids of the Year. Cayden has cerebral palsy and cannot talk or walk without help. His brother Conner found a way for them to compete in triathlons together. He swims tethered to Cayden in an inflatable raft. He bikes, pulling Cayden in an attached cart. He runs, pushing Cayden across the finish line. Why does he do it? Because it makes his brother happy. As you start your week, remember that there is more than one way to win. I want to win like Conner and Cayden—even if it means finishing last. Join the Tribe! Daily blog updates (2-4 per week) and an exclusive “weekly” newsletter only for subscribers. ←Whose Voice is in Your Head? Dirljivo. Svaka čast Conner i Cayden! Hvala Josh što si ovo podijelio sa nama.